This article was first posted on November 4 2012, and revised and re-published on June 16 2016. On Tuesday it is Melbourne Cup Day, which, more than any other day on the calendar, holds Australia in thrall. On the second Tuesday in November, at 3 pm, the nation collectively holds its breath while its most famous horse race, the Melbourne Cup, is run at Flemington in Melbourne. It’s known as “the race that stops a nation”, because at 3 pm you are expected to drop whatever you’re doing to tune in and watch the Melbourne Cup. Workplaces and schools may take the afternoon off to hold Melbourne Cup lunches, or at the very least switch a TV on just before 3 pm. It’s a day when almost everyone will place a bet on the race – even if it’s just putting a dollar on the favourite, or taking part in the office sweep. In Melbourne, the day of the race is a public holiday. American author Mark Twain went to the 1895 Melbourne Cup and commented, Nowhere in the world have I encountered a festival of people that has such a magnificent appeal to the whole nation. The Cup astonishes me. More than 110 000 people attend the race, and it’s a huge fashion-fest, with ladies frocking up, and gentlemen wearing formal suits. Others relish the opportunity to dress in outrageous costumes. It’s a day to eat, drink, gamble and be merry – a big, bright, boozy, and rather garish carnival. The Melbourne Cup itself is the jewel in the crown of the Spring Racing Carnival, and is said to be the richest and most prestigious “two mile” handicap in the world. The prize money is over $6 million, and the trophy itself is a hand-crafted golden cup worth $125 000. It’s the biggest prize in any Australian sporting event. 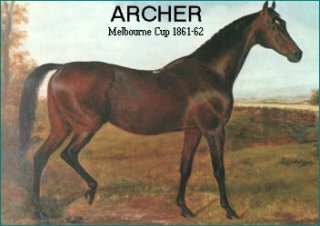 The first Melbourne Cup was run in 1861, and the winner that year was a horse named Archer. Race horses are often named quite logically, and Archer’s sire was William Tell. Born near Braidwood, in country New South Wales, he was trained near Nowra. Archer was a large horse, standing over 16 hands high with a powerful body. He ran badly in his first two races, and was rated poorly, until he won seven races in 1861, and was entered in the Melbourne Cup. The first Melbourne Cup was action-packed. Three horses fell during the race (two of them died), two jockeys suffered broken bones, and one horse bolted off the course entirely, but the race gamely continued, and Archer won by six lengths in a time of 3 minutes and 52 seconds – the slowest in which a horse has ever won the Melbourne Cup. He set another record the following year by winning the Melbourne Cup again; until the 1930s, he was the only horse to have won back-to-back Melbourne Cups. He was meant to enter in 1863 as well, but unfortunately there was a mix-up with telegrams and he didn’t manage to make the deadline in time. Many legends have sprung up around Archer, such as that he had to walk all the way from Sydney to Melbourne in order to take part in the race, and that his jockey, Johnny Cutts, was an Aborigine from the Nowra area. Neither of these stories is true – Archer travelled to the race by steamship and rail, and Johnny Cutts wasn’t Aboriginal, and was from Sydney. The phrase since Archer won the Cup has entered our language, to refer to a long time distant. Archer is an English occupational surname referring to someone who uses a bow and arrows. The surname was introduced to Britain by the Normans, and by the end of the Middle Ages the Norman-French word archer had replaced the English bowman. People have been hunting and fighting with bow and arrows since the Stone Age, and there are many famous archers in world mythology. During the Middle Ages, professional archers were rare, and most archers during war were recruited from the peasantry so archery was often seen as a lower-class pursuit. However, by the 14th century archers were used effectively in battle, making it a more attractive option. The use of firearms made archers obsolete, and the last recorded use of them in battle in England was in 1642. The last known person to die from a British archer in battle was in 1940, when a German was killed during the retreat from Dunkirk by a delightfully eccentric officer named Jack Churchill, who insisted on fighting throughout World War II with bow, arrows and a sword; he also played the bagpipes while setting off grenades, to add to the effect. Incredibly brave and highly decorated, Churchill, known as Mad Jack, was later a military instructor in Australia, where he became an enthusiastic surfer. A shame we didn’t manage to keep him, as this man is now my personal hero! Archer has been used as a personal name since the 17th century, and an early namesake was the British MP Sir Archer Croft, 2nd Baronet – Archer was his mother’s maiden name. Another who had Archer as a family name was the 18th century American politician Archer Mathews, a founder of Lewisburg in Virginia. In the 19th century, escaped slave Archer Alexander served as the model for the Emancipation Memorial in Lincoln Park, built by T.S. Eliot’s grandfather. Archer joined the Australian Top 100 in 2012, and since then has continued rising. Currently it is #39 nationally, #49 in New South Wales, #27 in Victoria, #33 in Queensland, #29 in South Australia, #51 in Tasmania, and #38 in the Australian Capital Territory. It was one of the fastest rising names in Victoria last year. Archer was a Top 1000 name in the US in the late 19th century, but spent many years off the charts until it returned in 2009. It has risen steeply since then, and is now #289. In the UK Archer has been in the Top 500 since 2012 and is currently #359. Archer is Top 100 in New Zealand – the only other country besides Australia where Archer is popular, although its popularity is highest in Australia. No wonder this handsome name is so popular – it feels both vintage and contemporary, and fits in with the trend for names with an AR sound, and names connected with hunting and weaponry. One of its attractions is that it provides a way to get the popular nickname Archie without using Archibald, although Arch is another possibility. Archer is a name from Australian history which celebrates the biggest sporting event of the year – one that almost everyone will participate in. It’s a name from the hunt and battlefield, but also referencing daring archers, from Robin Hood to the Hunger Games, and perhaps even comedy super-spy Sterling Archer from the animated show. Could Archer follow its equine namesake and gallop to the #1 position on the charts? The odds are against it, but chances are it will continue cantering along the home stretch. Archer received an outstanding approval rating of 93%, making it one of the most popular names of 2012. 36% of people loved the name Archer, and nobody hated it.